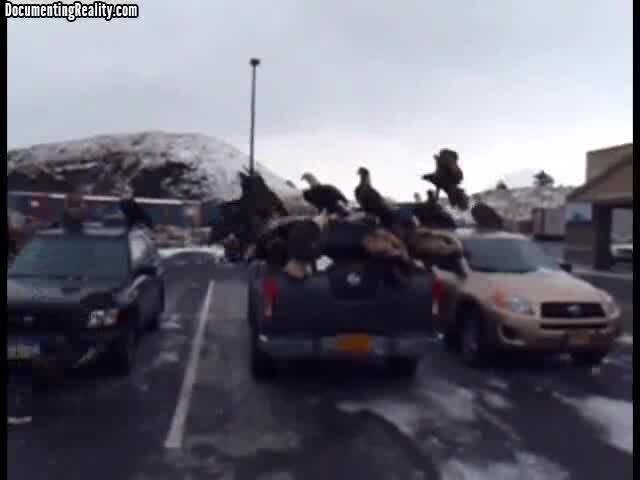 A flock of eagles descended on the Safeway parking lot last week, prompting police intervention. Public Safety Director Jamie Sunderland says several people called in short succession on Thursday afternoon to report the melee. Jessica Earnshaw’s car was parked next to the truck, and she says she was afraid of getting attacked if she got too close. When Officer Bill Simms arrived, Earnshaw says he put on his sirens, which scared off some of the eagles, and then he went into the fray. That is amazing! Paint damage tho I'm sure. I've had the same reaction feeding bread to the seagulls when they come in the winter. Not nearly as exciting or dangerous as eagles tho. What were they freaking out about? ? They wanted to dispose of the fish and the eagles were obviously hungry. Eagles are a protected species; they should have let them eat and made sure no one bothered them. Stupid.